how to outrun prejudice and oppression. feel the wind whispering in your ears. that makes your heart race. Find your purpose. Find your purpose. 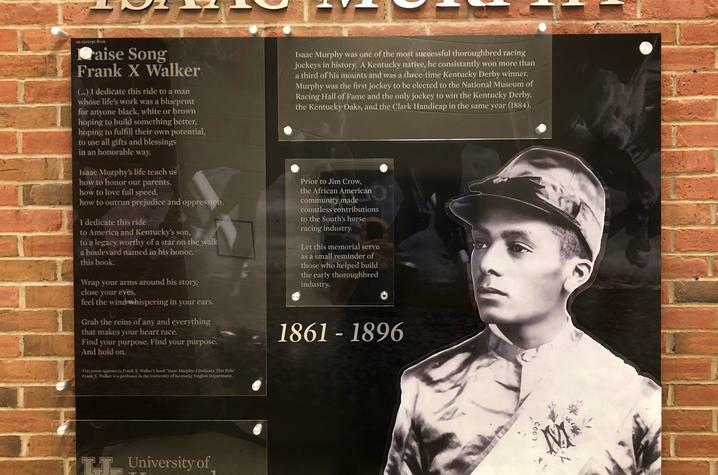 This excerpt from “Praise Song” from Frank X Walker’s book, “Isaac Murphy: I Dedicate This Ride” was recently installed a memorial honoring thoroughbred jockey Isaac Murphy (1861 – 1896) on the ground floor of the Agricultural Science Center. Professor Walker’s words, as they so often do, ignite in us a passion for this campus and this state, and a reverence for the brave men and women who came before us. His poem reminds us of hurdles faced, obstacles surmounted, and the still “heavy doors” we have yet to open. An unsung hero of Kentucky’s equine history, Isaac Murphy was the first jockey ever inducted into the National Museum of Racing and Hall of Fame in Saratoga Springs, NY. He is one of only two African American jockeys to have received this honor. The first to win three Kentucky Derby races, Murphy was also a four-time American Derby winner, and a five-time Latonia Derby winner. Having won more than 44 percent of his races—628 races out of 1,412—Isaac Murphy is considered one of the greatest riders of all time. His story is one of perseverance, resilience, and passion. It echoes a powerful lesson still palpable today. More than any other setting, college campuses must be spaces where we instill in young people the skills to absorb, understand, and navigate fundamental tensions. We are called to cultivate empathy – the ability and the desire to walk a mile in another’s shoes, to see through someone else’s eyes – to experience what they experience, so that we fulfill our responsibility to one another and the essence of what it means to be human. I’m grateful that, thanks to the Herman Lee and Nell Stuart Donovan Memorial Trust, the University of Kentucky College of Agriculture, Food and Environment has installed this important piece. Across campus, members of the UK community are working every day to foster a more open, inclusive, and accepting community—one where every person feels an unshakable sense of belonging. We always have more work to do. But we are committed to taking the ride together.